Staff and residents at Wesley Towers teamed together to help raise awareness for Alzheimer's, the 6th leading cause of death in the United States. Leading up to the event, Team Wesley Towers raised funds by selling t-shirts in addition to monetary donations to help us raise over $1,100 for the Alzheimer's Association. 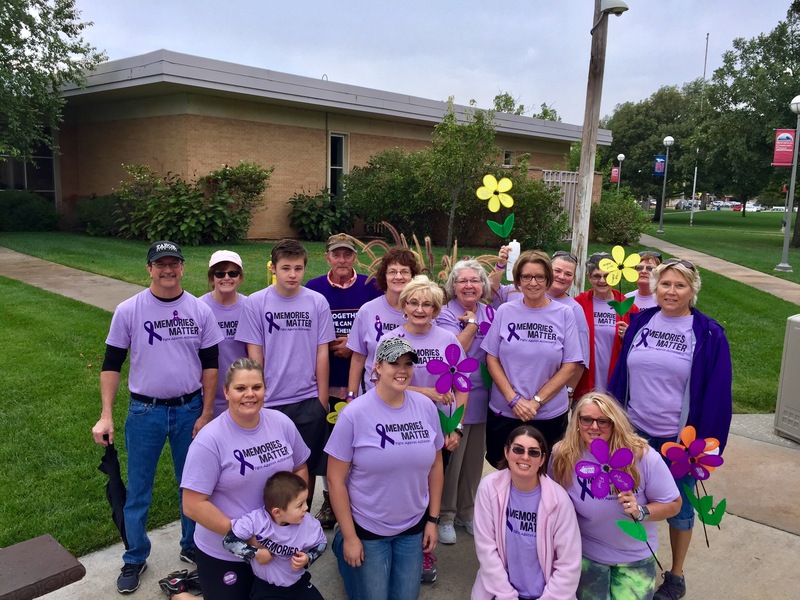 The Hutchinson walk consisted of 26 teams where collectively the teams were able to exceed the Hutchinson Walk to End Alzheimer's goal of $22,000! On the morning of Saturday, September 16th, Team Wesley Towers gathered at Hutchinson Community College for the 2 mile walk. We didn't let a little rain stop us from raising awareness of Alzheimer's! Together we had a blessed day with many smiles and great memories of loved ones lost or fighting this terrible disease. Team Wesley Towers sincerely wants to THANK YOU for everyone who helped to support and walked for such a great cause. Together, our people make the difference!